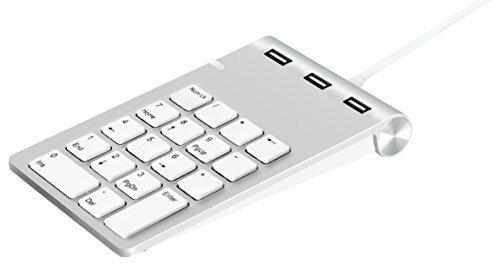 This keypad was designed with iMacs and MacBooks in mind with its sleek Apple-style curved edge and it adds a number pad to your existing keyboard and three usb 2.0 ports to your PC/ Laptop for quick and comfortable data entry. • "↑ ← ↓ →" , "Num Lk" ,Home, End, Ins, Del, PgUp and PgDn buttons work with Windows XP/Vista/7/8/10, however NOT with Mac OS. Apple-style design creates a natural extension to your Mac. Palm-size and lightweight design effectively saves space, yet doesn't overload your pocket or bag, take a mobile USB work station anywhere you go! No drivers required for Windows (32/64 bit) 10 / 8.1 / 8 / 7 / Vista / XP, Mac OS X 10.6 to 10.9, Linux 2.6.14 or above.